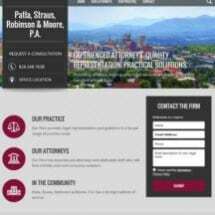 Founded in 1953, the law office of Patla, Straus, Robinson & Moore, P.A., has provided business owners and individuals across Western North Carolina with quality, cost-effective legal solutions. From offices centrally located near the Buncombe County courthouse in Asheville, the law firm provides counsel on a wide range of legal matters, including business and corporate law, real estate issues, estate planning and litigation. Several attorneys with the firm have more than 30 years of practical experience obtaining resolutions to various legal disputes. As a full-service law firm, Patla, Straus, Robinson & Moore, P.A., has assisted individuals for more than a half century with their estate planning. This includes drafting wills, health care directives and trusts that ensure the tax-efficient transfer of gifts between generations and provide clear direction to reduce family discord. Obtaining a desired result may require taking a case to court. Lawyers with the firm litigate contract disputes, real estate matters, will contests, and criminal felony charges in North Carolina. Handling both business and corporate law issues along with personal matters allows clients to address all their legal needs under one roof. Attorneys with our firm provide candid counsel and work diligently to resolve legal issues in the most efficient and cost-conscious manner. Royal Crown Cola Bottling Co.
United Way of Asheville and Buncombe County, Inc.
YMCA Blue Ridge Assembly, Inc.